Seven members of staff from the TORT Centre were invited by the Dean of Medicine, Professor Gary Mires, to attend a Long Service Awards ceremony for staff who have worked at the University for 15 years and over. A total of 103 recipients from across the School of Medicine were invited with awards being presented at a drinks and reception ceremony within the Promenade Area of the Medical School at Ninewells Hospital on Thursday 18th at 2:00pm. 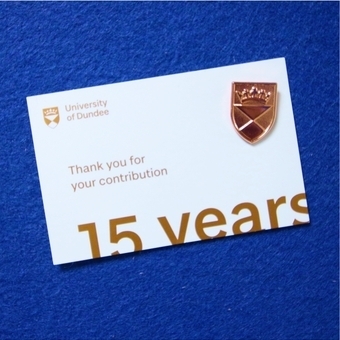 This follows on from last month’s Long Service Awards for staff having worked at the University for periods of 25 and 40 years when Heather Ferguson (38 years) and Ian Christie (26 years) were invited to attend an Awards Ceremony and afternoon tea at the Apex Hotel, and recieved a 'Silver' lapel pin. “We are a relatively small team here at the TORT Centre so for nine of us to be invited to the two Long Service Awards ceremonies organised by the University to celebrate its own 50th Anniversary speaks volumes for our Team’s work ethic and values”, stated Professor Abboud. “By my reckoning we have amassed an amazing combined total of almost 250 years’ service between us!